The early Dál gCais carried on their banners the Claíomh Solais of Nuada. One of the Four Treasures of the Tuatha Dé Danann. The Dál gCais ([d̪ˠaːlˠ gaʃ]; English: Dalcassians) was a Gaelic Irish tribe, generally accepted by contemporary scholarship as being a branch of the Déisi Muman, that became a powerful group in Ireland during the 10th century. Their genealogies claimed descent from Cormac Cas, who is said to have lived in the 3rd century AD. Their known ancestors are the subject of The Expulsion of the Déisi tale and one branch of their blood-line went on to rule the petty kingdom of Dyfed in Wales during the 4th century; probably in alliance with Roman emperor, Magnus Maximus. Brian Bóruma is perhaps the best known king from the dynasty and was responsible to a significant degree for carving out their fortunes. The family had built a powerbase on the banks of the River Shannon and Brian's brother Mahon became their first King of Munster, taking the throne from the rival Eóganachta. This influence was greatly extended under Brian who became High King of Ireland, following a series of conflicts with Norse and other Irish tribes, before dying famously at the Battle of Clontarf in 1014. Following this the Dál gCais provided three more High Kings of Ireland; Donagh O'Brien, Turlough O'Brien and Murtagh O'Brien; but lost out to the longer established dynasties. It wasn't until the 16th century, unable to be defeated militarily, they agreed to surrender and regrant their kingdom to Henry VIII Tudor, joining the nobility of the Kingdom of Ireland. Their realm was renamed County Clare, though they remained influential. In later times, remarkable figures include writer Standish James O'Grady, who is called "Father of the Celtic Revival" and William Smith O'Brien who played a leading part in the Young Irelander Rebellion of 1848. In diaspora, prominent figures have included Marshal Patrice de Mac-Mahon, President of France, as well as John F. Kennedy and Ronald Reagan, who were both Presidents of the United States. In their own genealogies, the Dál gCais traced their line back to their eponymous ancestor and progenitor Cormac Cas, who is said to have lived in the 2nd to 3rd century. They make him a second son of Ailill Aulom from the Deirgtine, a King of Munster and Leath Moga more generally, associated in a story with the goddess Áine of the Tuatha Dé Danann during the Cycles of the Kings of Irish mythology. Cormac Cas himself was purported to be the younger brother of Eógan, founder of the Eóganachta, who would go on to rule Munster for many centuries. While this was taken on face value for a long time, later Irish scholars came to question its validity, regarding it as a politically motivated fabrication. The Dál gCais were becoming powerful in the 10th century, with Mahon and his brother Brian Bóruma taking the throne in Munster from the Eóganachta; claiming ancient kinship with their rivals would have boosted their legitimacy. It is claimed by current scholarship that the Dál gCais were instead a branch of the Déisi Muman. The Déisi Muman held a vassal kingship in Munster under the Eóganachta, significant in scope, consisting of what is today Waterford and its environs. As time went on branches also emerged around the River Shannon, as part of the Déisi Muman moved north-westerly between the 5th and early 8th century; they were called the Déisi Deiscirt and the Déisi Tuisceart. It is from later, more northerly branch, which the Dál gCais are said to ultimately find their true ancestors. The first recorded mention of their adoption of the new name Dál gCais specifically is in the Annals of Inisfallen for the year 934, which records the death of their king Rebachán mac Mothlai. The Déisi Muman themselves are subject of The Expulsion of the Déisi epic in the Cycles of the Kings, which is set during the time that Cormac Ulfada was High King of Ireland. The story describes the expulsion of the Dal Fiachrach Suighe; kinsmen of the Connachta and descendants of Fedlimid Rechtmar; from Tara, coming to settle in Munster after many battles. Upon becoming the Déisi Muman, one branch then sailed across to Britain in the 4th century, coming to rule Dyfed. Their presence in Britain may have been initially supported by Magnus Maximus, Roman Emperor, as part of a policy of backing Gaelic vassals to be seafaring defenders of the shores of Britain facing the Irish Sea from pirates. Eoin MacNeill has pointed out that they were not the only Irish colony in the area, with the Uí Liatháin also powerful. The adoption of the name Dál gCais and the ascent of the group to greater power, began to take place during the 10th century with internal political transition. With the death of Rebachán mac Mothlai, the leadership of the Déisi Tuisceart shifted from the Uí Aengusa kindred to their junior relatives the Uí Thairdelbaig. It was during the time of Kennedy, who styled himself King of Thomond, that the Dál gCais began to challenge the Eóganachta; though Kennedy was defeated at the Battle of Gort Rotacháin by Cellach Caisil, King of Munster in 944. The actual reason for this sudden surge has been much debated and one frequently discussed thesis is that it was a political scheme of the Uí Néill, intending to use the Dál gCais as proxies to further weaken the power of the Eóganachta. Kennedy's children built on their father's achievements. His daughter Órlaith became Queen consort of Ireland, after she married Donagh Donn, a High King of Ireland from the southern branch of the Uí Néill. Mahon became the first Dál gCais to gain the kingship of Munster, after he seized the Rock of Cashel from Molloy of the Eóganachta. Leading up to this he had defeated the Norse under Ivar of Limerick at the Battle of Sulcoit in 968. After Mahon was captured by Donovan in 976 and murdered by Molloy, the Eóganachta returned to the throne at Cashel for two years, but Mahon's younger brother Brian Bóruma, a seasoned military man from the early campaigns, would desire vengeance. A campaign in 977-78 led to the defeat and death of Ivar, with an engagement at Scattery Island being the most significant. Brian retained the formerly Norse Limerick for its trading power and naval strength. The Dál gCais took back Munster at Belach Lechta the same year, killing Molloy in the process. Ambition saw Brian look next to the territories of Malachy II, High King of Ireland. A closely contested war of 15 years ensued, with the naval ability of the Dál gCais paying off as a truce was called by Malachy in 997, recognising Brian's overlordship of Leath Moga. They became allies against Norse Dublin and the Laigin who under Máel Mórda, King of Leinster had risen against Brian's claims. The latter were subdued at Glenmama in 999, before rebelling again in 1014 at Clontarf where Norse power in Ireland was finally broken, though Brian died in the process. In the interim, Malachy had passed the High Kingship to Brian in 1002 and he built strong Christian links to Armagh. After the death of Brian, his two established surviving sons; Donagh and Teague; struggled in an internal Dál gCais rivalry for dominion. While Donagh was High King, many other Irish kings allied against him, including Leinster, Connacht and Ulster. Deposed in 1063, he fled to Rome, with some sources claiming he granted Pope Urban II the Irish crown, this is controversial however. [note 2] Teague's son Turlough took up the reigns in a lasting alliance with the powerful Dermot Kinsella, King of Leinster. Not a military leader, Turlough was instead a capable politician, the Cogad Gáedel re Gallaib glorifying Brian's feats would be authored during his lifetime. 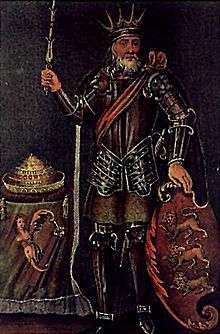 Turlough's son Murtagh would be the last High King from the Dál gCais of the medieval period, reigning between 1101–19. Murtagh attempted to make the Irish kingship more along the lines of European monarchies and was involved in foreign affairs (allying with Arnulf of Montgomery in the Welsh Marches against Henry I, King of England), trying to extend Irish influence beyond internal rivalries. The septs of the Dál gCais developed over time, with new ones breaking off to form separate surnames at different times, but all claiming to share the same paternal line (with a few biological exceptions along the way due to adoption or extra-marital issue). Their eponymous founder Cas had severals sons; two of them gave their names to the Uí Bloid and Uí Caisin kindreds, another founded the Cineal Fearmaic. As the proto-Dál gCais moved up into what is today East Clare, these became associated with rooted tribal areas, but were themselves internally divided into any other septs. In the 21st century, geneticists studying the DNA of various people with Gaelic Irish surnames have identified the Dál gCais as a unique strain of Haplogroup R1b known as Irish Type III. The senior line descended from Cas' first son Bloid and they provided the Kings of Thomond. Initially the leaders of the tribe were a sept known as the Uí Aengusa from which descends O'Curry, O'Cormacan and O'Seasnain. However, during the 10th century, this passed to the junior Uí Thairdelbaig. It is this kindred which would furnish the High Kings of Ireland and the Kings of Thomond including Brian Bóruma. From the Uí Thairdelbaig came O'Brien, O'Kennedy (who were Kings of Ormond), MacConsidine, MacMahon, O'Reagan, MacLysaght, O'Kelleher, Boland, Cramer, Kearney, O'Casey, Power, Twomey, Eustace, Ahearne, MacGrath, Quick, O'Meara, Scanlan, MacArthur, Cosgrave, O'Hogan, Lonergan and others. O'Noonan and Coombe are other notable Uí Bloid descendants. A younger brother of Carthann Fionn (who both the Uí Thairdelbaig and Uí Aengusa derive) named Brennan Ban stands at the head of the genealogies for the O'Brennan, Glinn, Muldowney and O'Hurley septs. Although a junior line, the Uí Caisin continued to have a prominent role and the leader of their kindred in Thomond were the MacNamara, who as Lords of Clancullen, were the second most powerful family after the O'Brien. Other families descended from the branch of Carthann (son of Caisin) include Harley, Flood, Torrens, Stoney, Hickey, O'Hay, Clancy, Neylon and Flattery. Carthann had brothers named Eocha and Sineall from whom descends the O'Grady, Tubridy, Hartigan, Durkin, Killeen and Hogg. In addition to this, there are the Cineal Fearmaic who claim to descend from Aengus Cinathrach, a brother of Caisin and Bloid. This kindred included the O'Dea as leaders, as well as the O'Quin, O'Heffernan, Kielty and Perkin. Within the traditional Gaelic culture of Ireland, society rested on the pillars of the tribal nobility, bardic poet historians and priests. Different families had different roles to play and in many cases this was a hereditary role. However, the nature of this system, known as tanistry was aristocratic ("rule by the best") in the truest sense, in that if the tribe thought a younger male member of the family was more suitable to succeed to a role than an older sibling, then they could. The Norman and wider European concept of strict primogeniture was not completely adopted until after some of the families joined the peerage of Ireland. The most powerful Dalcassian family of the hereditary Gaelic nobility were the O'Brien (Kings of Thomond), followed by MacNamara (Lords of Clann Cuilean), O'Kennedy (Kings of Ormond), MacMahon (Lords of Corca Baiscinn), O'Grady (Lords of Cinél Dongaile) and O'Dea (Lords of Cinél Fearmaic). Some of these families later joined the peerage of Ireland after the surrender and regrant to the Tudors during the 16th century. The O'Brien were initially Earls of Thomond, but later became Barons Inchiquin which they hold to this day. The O'Grady were Viscounts Guillamore, while the O'Quins became Earls of Dunraven. A branch of the MacMahon family became Marquis de MacMahon d'Eguilly in the Kingdom of France, later raised to Dukes of Magenta under Emperor Napoleon III. The Clancy sept were the hereditary Brehons of Thomond and held a very powerful position when it came to law in the kingdom. Even after the end of the Gaelic order, they continued to play a role, providing a High Sheriff of Clare in the form of Boetius Clancy. Famously participating in the Contention of the Bards in support of the honour of the tribe, the MacBrody sept were the principal poets and historians of the Dál gCais over the course of centuries. The O'Hickey and Neylon sept would serve as hereditary physicians to the Dalcassians of Thomond. After the Norman Butler dynasty took Ormond, the Dalcassian sept of O'Meara became their hereditary physicians, this line included Barry Edward O'Meara, who was with Emperor Napoleon I in exile at St. Helena. Mahon 976 First member of the tribe to become King of Munster. Brian Bóruma 1014 King of Munster, first of the tribe to become High King of Ireland. National symbol of Ireland. Donagh O'Brien 1064 King of Munster, lost to the Eóganachta and retired to Rome. His brother Teague was a contender. Turlough I O'Brien 1086 King of Munster, regained from the Eóganachta, also won back the High Kingship of Ireland. Murrough I O'Brien 1119 King of Munster and High King of Ireland. Later years were disputed with brother Dermot. Conor O'Brien 1142 King of Thomond as the crown of Munster was divided between Thomond and Desmond. Turlough II O'Brien 1167 King of Thomond, claimant to Kingdom of Munster. Murrough II O'Brien 1168 King of Thomond, claimant to Kingdom of Munster. Donal O'Brien 1194 King of Thomond, claimant to Kingdom of Munster. Defeated the Normans several times. AI1021.2 Mael Muire Ua Gébennaig, eminent priest of Dál Cais, rested. ↑ The Norman de Clare family who claimed the area as a barony of the Lordship of Ireland, were themselves an illegitimate branch of the House of Normandy, who, under William the Conqueror won the Kingdom of England in 1066. ↑ Donagh certainly fled to Rome and was buried at the Basilica di Santo Stefano al Monte Celio. The stories about his time there are recorded by Geoffrey Keating in the 17th century, some with skepticism. The story was used in the 19th century as a potential explanation for Laudabiliter. ↑ Most information about the relationship between septs and their genealogical root can be found in John O'Hart's Irish pedigrees; or, The origin and stem of the Irish nation, where he worked from 17th century genealogists Cú Choigcríche Ó Cléirigh and Dubhaltach Mac Fhirbhisigh, as well as the Annals of the Four Masters. ↑ "Coat of Arms". The O'Brien Clan. 8 March 2011. 1 2 Koch 2006, p. 554. 1 2 3 4 Duffy 2004, p. 121. ↑ Davies 1994, p. 52. ↑ Rynne 1967, p. 230. ↑ "Dál gCais or The Dalcassians of Thomond". DalcassianSept.com. 12 November 2008. Archived from the original on 8 September 2010. 1 2 3 "Irish Pedigrees, O'Brien". DalcassianSept.com. 12 November 2008. Archived from the original on 19 September 2010. ↑ "A Set of Distinctive Marker Values Defines a Y-STR Signature for Gaelic Dalcassian Families". JOGG.info. 7 July 2011. ↑ "The Kingdom of Thomond". Clan MaConmara. 7 July 2012. ↑ "Irish Pedigrees, MacNamara". DalcassianSept.com. 12 November 2008. Archived from the original on 19 September 2010. ↑ "Irish Pedigrees, O'Grady". DalcassianSept.com. 12 November 2008. Archived from the original on 19 September 2010. ↑ "Irish Pedigrees, Durkin". DalcassianSept.com. 12 November 2008. Archived from the original on 19 September 2010. ↑ "The Surname Ó Caiside". Brian Ó Cuiv. 12 November 2008. 1 2 "Irish Pedigrees, Quin". DalcassianSept.com. 12 November 2008. Archived from the original on 19 September 2010. ↑ "The Dalcassian Knights, Gaelic Social Structure by Patrick M. O'Shea". DalcassianSept.com. 23 July 2012. ↑ Moody 1991, p. 519. Byrne, Francis John, Irish Kings and High-Kings. Four Courts Press. 2nd edition, 2001. O'Brien, Barry, Munster at War. Cork: Mercier Press. 1971. Todd, James Henthorn (ed. and tr. ), Cogadh Gaedhel re Gallaibh: The War of the Gaedhil with the Gaill Longmans. 1867.